Two part issue with the Propeller Project Board. I'm trying to move a project off a Propeller Activity Board (32910 Rev Bravo) and put it on a Propeller Project Board (32810 Rev Bravo). The project concerns playing a WAV file and outputting the audio to an external speaker. The code works fine on the PAB. To play the WAV file, I'm using code from the TEST VOV VOLUME.C tutorial. In that code, the microSD connections are DO, CLK, DI, and CS. 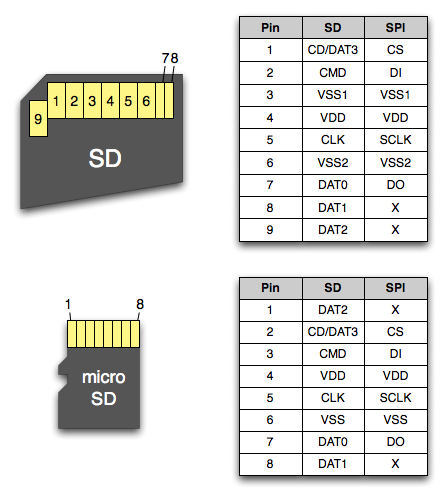 However, on the PPB, the microSD connections are labeled as DAT1, DAT0, CLK, CMD, CS/DAT3 and DAT2. I've yet to find a cross-reference (although I have made the bold assumption that CLK is probably the same as in the code, and that CS/DAT3 likely corresponds to CS). Second issue...the PAB has a built-in audio output jack, the PPB doesn't. What pins do I need to connect a speaker to in order to hear the audio on the PPB? You will have to add some audio amplifier to the board. The pins used for audio on the Activityboard are P26 and P27, but you can also use others if you change it in the code. The simplest audio circuit is just a 270 Ohm resistor between the pin and the jack, this works for headphones. Connect also Ground of the jack and the board. Better circuits you will find in the schematics Publison pointed to.